The Fat Quarter Shop is excited to welcome one of the sweetest designers we have ever met to the Jolly Jabber, Deb Strain. 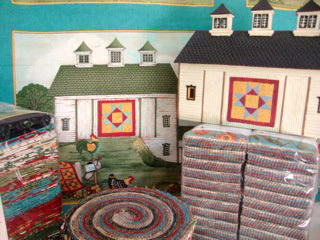 Deb’s latest fabric collection is Coming Home from Moda. Q: What was the first seed that grew into the Coming Home collection? 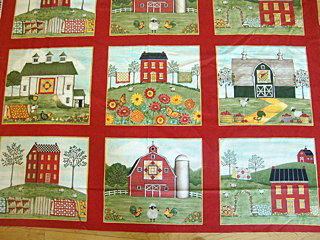 A: Living in rural Ohio, we are surrounded by wonderful barns, old and new, and the recent tradition of Barn Quilts. I wanted to incorporate these beautiful tributes to the love of quilting, and the feeling of "coming home" to this fabric group. A: My favorite print within this group would have to be the panel! It brings back so many heartwarming memories of weekends at my grandparents' farm each time I look at it. A: I would love to see a quilt that incorporates all 6 blocks from the panel. 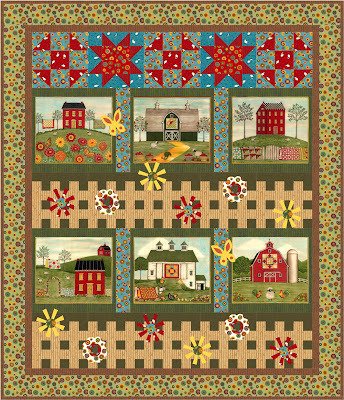 Barb Cherniwchan from Coach House Designs has actually captured this in her quilt pattern "Country Road." I love it! 1. Where did you grow up and where do you call home? I grew up in Springfield, Ohio and now live in a very small village, Gettysburg, Ohio. 2. Do you have any pets and what are their name(s)? 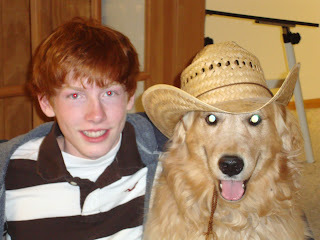 Shelby, our 6 year old golden receiver, is definitely a member of the family! Most days she sits at my feet while I am painting and sleeps with my son at night. When my sweet husband takes my plate to put in the dishwasher, before I am finished eating! 4. What is the most important part of a sandwich? Damask. I love almost any damask!